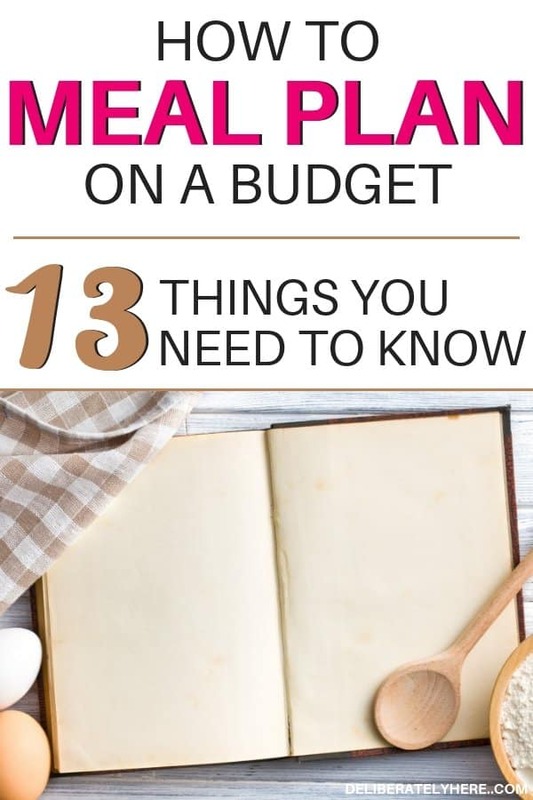 If you have never meal planned before, deciding to start a meal plan when you’re on a tight budget can be a daunting thought, but I am confident that it will end up being one of the best decisions you will make for your health and your finances. 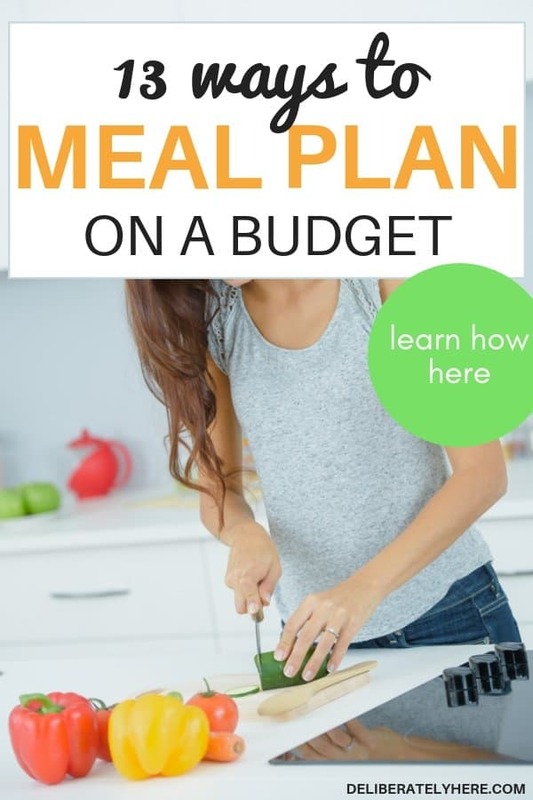 If you are ready to start taking your budget seriously, this post will help you learn how to meal plan on a budget. Many people will be quick to convince you that meal planning is so easy it’s perhaps even foolproof. They’ll tell you it’s something you could never fail at. I disagree completely. Meal planning is work. It requires dedication and a willingness to put effort into it from you. If you’re just learning how to meal plan the bad news is, it’s not going to be as easy as some people promise it will be. When I first tried my hand at meal planning I failed miserably. I tried for months and months, but I just couldn’t get the hang of it. I would end up still going to the grocery store several times a week because I forgot something that I needed or because I decided that I didn’t want to make what I had on my meal plan and had decided that I was going to make something else. It wasn’t long before I realized that this wasn’t working for us. I wasn’t saving any money and nothing had changed in the way I shopped or did our meals. Had I not been so determined to save money on groceries, I would never have tried meal planning again and I would have ended up being a meal planning failure story. Since I was bound and determined to do something about our sky-high food costs, and since everywhere I looked people swore by meal planning, a while later I decided to give it another try. 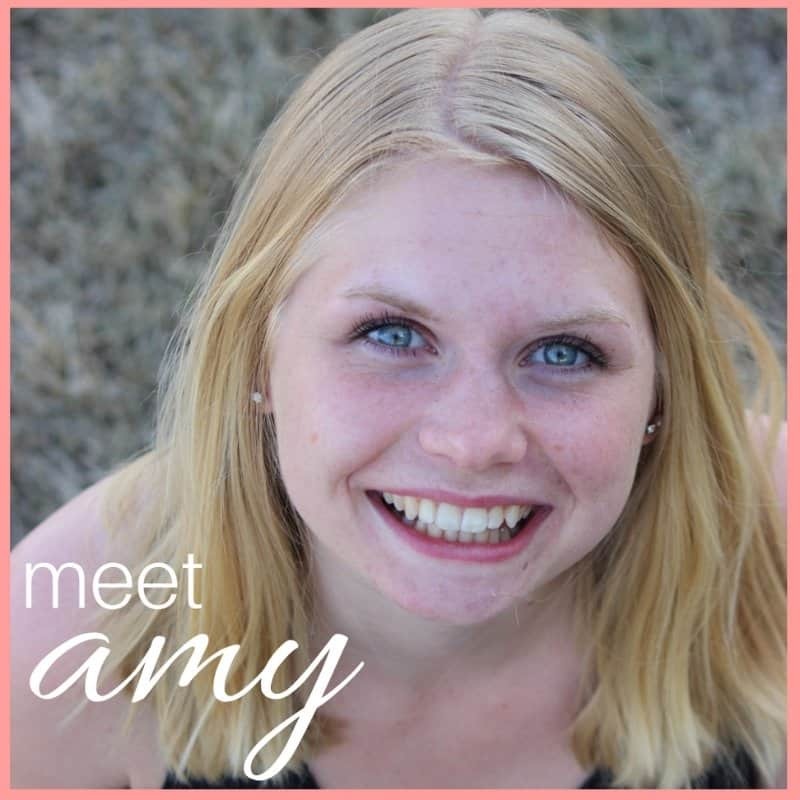 This time around I learned more about it and I realized that it was okay if the exact way someone meal planned didn’t work for our life, I could alter some of the steps and create my process of meal planning that would work for my husband and I. And this time, it worked. I’ve been meal planning ever since and it has become like second nature to me. That’s the beauty of it, it can be difficult to get the hang of at first, but once you create a process that works for you, it will take minimal time out of your day and it’ll be a piece of cake. If you’re here, chances are you have already realized that the cost of food is through the roof and you need to make a change. 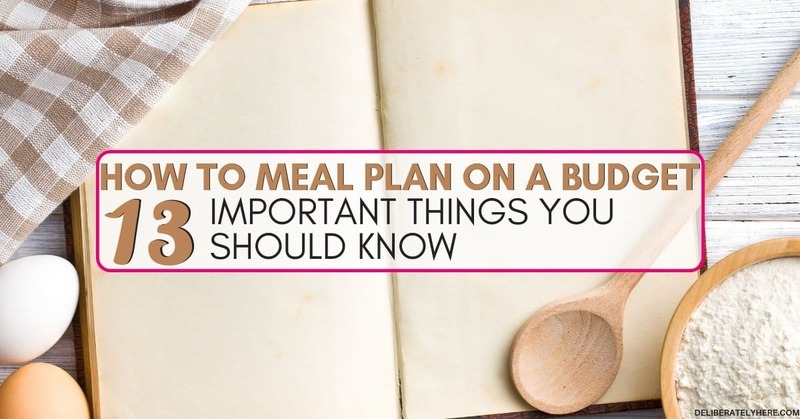 Though you may have already decided to start a meal plan, you might not know exactly why you’re meal planning, and what benefits you will gain from it. Meal planning not only helps you save money on food and groceries, but it also helps promote healthier eating habits. With meal planning, you will be lowering your monthly food costs dramatically simply by cutting all those last-minute shopping trips out of your life and learning to plan your meals around what is on sale that week. 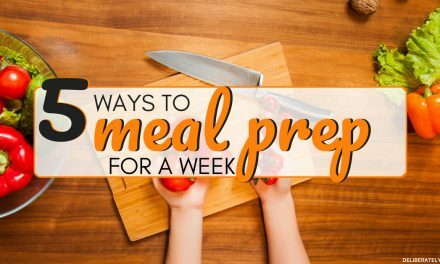 You will be promoting a healthier lifestyle with meal planning by having all your meals for the week planned out, even meals for the busiest of nights. That way when it’s time to make dinner after a long, tiring day of work, you don’t reach into the freezer for one of those “oven-ready” meals or TV dinners that are buried at the back for busy nights like tonight. Those premade meals that you buy from the store are usually not very healthy at all and they aren’t very nice on your wallet, either. When you are meal planning you will want to keep in mind which nights of the week are your busy nights, then plan meals according to that. If you have evenings where you only have 30 minutes or less to make dinner, plan quick and easy meals for those nights. Meal planning wipes away all the stress of not knowing what’s for supper. When you meal plan you will always know what’s on the menu for that week so you can start preparing and making supper as soon as you have time, no more wasting time sitting around trying to wrack your brain for dinner ideas. One of the most important steps in getting your finances under control is having a plan for your money. That is exactly what meal planning is. It is creating a plan for the portion of your money that goes towards food every month. Create your meal plan around your weekly schedule. If you have days that you already know are going to be busy, plan to have meals that are quick and extremely simple to make on those nights. Planning meals around your schedule is an important step in meal planning. If you plan a meal that will take an hour plus to prepare and cook on a night that you only have half an hour to make dinner, it’s not going to work out. If you enjoy making meals that are longer to make, plan to make those meals on evenings that you don’t have much planned and have lots of time to cook. Creating a recipe bank of yours and your family’s favorite recipes is what will make meal planning painless and as quick as possible in the future. Instead of spending hours upon hours searching through recipe books and online for meals that sound good, start writing down any recipes that you have made in the past that were a hit with your family. Then, any time you come across another recipe that you make and enjoy, or even a recipe that you haven’t yet tried but want to, write it down in your recipe bank. Over time your recipe bank will grow and grow, and it will become the main place that you go when you are creating your meal plan and don’t know what meals to make. Using meals out of your recipe bank are a perfect option because you can’t go wrong. These are recipes you have made and turned out well and you know your family enjoys. You don’t need to question whether or not it will get eaten at dinner. You can buy a cheap notebook for your recipe bank or keep a document going on the computer for quick ways to delete and add different recipes. You can even put different columns in your recipe bank, columns like “recipes I’ve made” and “recipes to try”. Under the “meals I’ve made” column you will write down any recipes that you have made that everyone enjoyed. Under the “recipes to try” column you can write down any recipes you come across that spark your interest but you haven’t yet made. 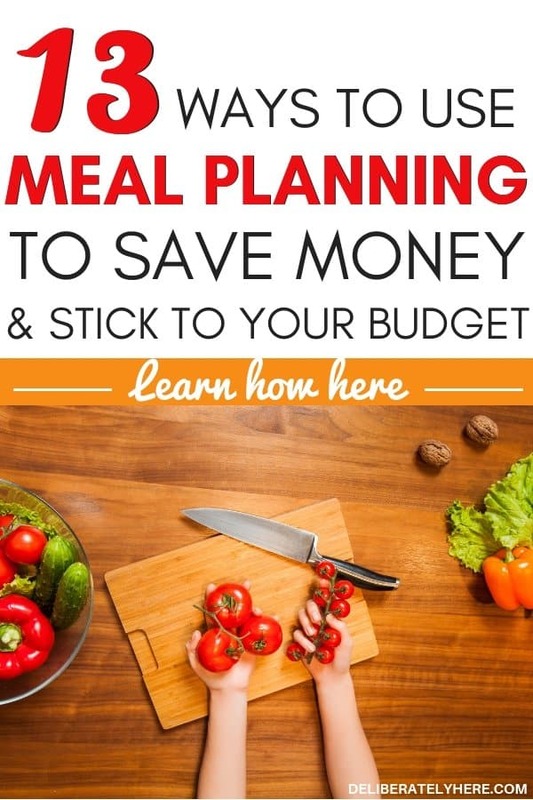 The next step in your how to meal plan on a budget journey is finally getting your meal planning template. You can grab a free weekly and monthly meal planning template here, or you can easily create your own in a notebook or on a scrap piece of paper. To make it simple, I would start off by just writing down your dinner meals. Some people like to write down a meal plan for breakfast, lunch, and dinner, but if you are just starting off I would highly recommend simply starting with dinners for a few weeks. You can either have a weekly meal plan (which is what most people prefer), or you can have a monthly meal plan (which requires a lot more work and I would recommend you start with a weekly meal plan). Now that you have your meal planning template you can start planning meals for the week. Again, don’t forget to plan around your schedule. Put a mark on any days that are going to be busy so you remember to plan an easy meal for that night. Once you’re ready to start planning out your meals, you will first want to look through all your local flyers at items that are on sale that week. Once you’ve found all the sale items (of food that you will actually eat and can make suitable meals out of), it’s time to find meals that you can make with those ingredients. If cottage cheese, ground beef, and tomato sauce are on sale, a good meal to make with those ingredients would be lasagna. If kidney beans and tomatoes (canned or fresh) are on sale, you could make chili. If potatoes and chicken are on sale, you could make baked chicken with baked or mashed potatoes. It might take a bit of time, but after a little bit of practice, you will get used to putting ingredients together and thinking of meals to make with them. When you are writing out meals that you will make for a week, keep in mind that if you are making a big meal you will likely have leftovers that will need to be eaten. You can either pack those leftovers for lunch the next day or you could use those leftovers to add into another dinner or, if you have lots of leftovers, heat them up for another whole dinner. It’s easy to get caught up in planning meals and think that you need to think of 7 different meal ideas, when in reality you may have leftovers from a couple meals that you could put together to make another meal or two, so then you would only have to plan 5 or 6 meals that week. Finally, it’s time to fill in your meal plan. 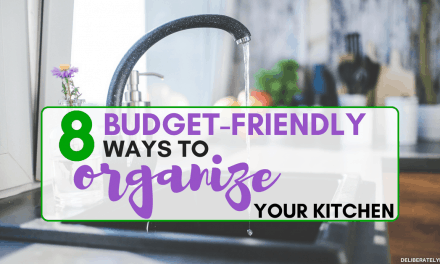 You have your recipe bank started, you have your schedule in mind, you have your meal planning template, and finally, you’ve looked through the flyers to find sale items and thought up a couple good recipes. Now it’s time to put it all together. Take your meal plan template and start writing the meals that you will have on certain days down on the template. Since you already made a mark on the busy days of the week this should keep it simple so you remember that on those days you need to have easy meals planned. The rule of thumb when saving money on food is to always, always shop with a list. Never go to the grocery store without your grocery list. Before you go shopping, you will have to look at each recipe on the meal plan that you just created and write down all the ingredients you need to make that recipe. Then, with the items that are on sale on your grocery list mark down beside them which store they are on sale at so you remember to buy them there and not at a different store for full price. I find grocery shopping the quickest and simplest when I split my shopping list up into groups. I put all the produce I need to buy together in one group, then I put all the dairy products together in another group, all the meat products grouped together, and so on. I also try to write the groups down in the order I will go to them in the store. If the produce section is the first section that I come to at the grocery store and is right next to the dry pasta and canned goods section, I will put produce first on my list, then I will put any canned goods or dry pasta that I need next, and so on. 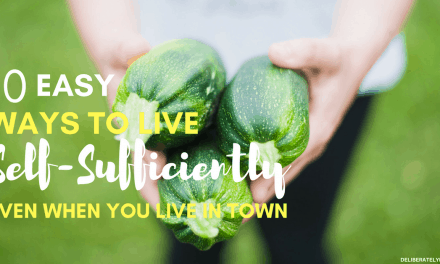 This requires a bit more time when making the shopping list but it cuts out a significant amount of time that I spend at the grocery store (and less time spent at the grocery store = less money spent). Since I like to work my way down my grocery list from top to bottom rather than jumping around all over the place, I find this process the one that works the best for me. Split your grocery list up however you find works best for you so you can spend the least amount of time possible in the store. Designating a certain day of the week every week for shopping is a good way to get into the habit of getting your meal planning and shopping done on the same day of the week each week so you don’t run into days that you haven’t planned for yet. Generally, you will want to make your designated shopping day after the new flyer comes out so you have time to look through the sale items of the week. If you make your shopping day on the last day of the flyer prices you may miss some good sales. Our local flyers come out on Thursdays and Fridays, so if I will often go shopping on Mondays. This way sale items are usually still stocked up and it’s much less busy if I go during work hours than it is in the evenings. Once you’ve got your meal plan and shopping list all filled out before you head out to the grocery store you will want to shop your house first. This means you should look through your pantry, fridge, freezer, and cupboards to see if you already have at home anything on your shopping list. If you do, simply cross the item off of your list. If you keep a well-stocked pantry you should be able to cut a decent amount of items off of your grocery list without even going to the store. There’s no point in buying more tomato paste if you already have 3 cans at home. 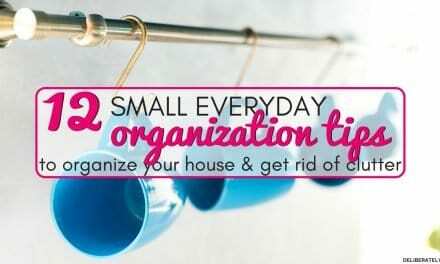 Instead, use up what you have at home then next time you’re in need of it you can put it on your shopping list. When I do finally make my way to the grocery store I try to make a habit out of shopping the clearance aisle first. This way I may be able to find some things that are on my grocery list at a very discounted price. If you’ve never shopped your grocery store’s clearance aisle before and don’t know where it is you can simply ask a worker to point you in the right direction. The clearance aisle at our grocery store isn’t huge, but I am usually able to get at least an item or two off of my shopping list from the clearance aisle. After you’ve looked through clearance you can then go start your shopping trip, remember to always keep your eyes open for sales and shop no name if it is an option. Wasting food starts at the grocery store. As much as you might be thinking that wasting food happens in your kitchen, while that is true, it first starts at the grocery store. It starts with buying food that you really don’t need. When you buy more food than you need, some of it is going to go bad before it has a chance to get used up. When that happens you are literally throwing your money in the trash. This is why shopping with a grocery list (and following that list) is SO important when it comes to saving money on food. Make sure when you make your grocery list that you only write on it things that you really need. If you are buying a whole package of peppers but only need one for your recipe, make sure there is another meal during the week that you can use those peppers in so they don’t go bad. The next step in how to meal plan on a budget is keeping old meal plans for reference. I rarely throw out my used meal plans. I like to store them together so I can look back at them over the months to see what meals I have previously made. When I don’t look back on my meal plans for a while I often find that I make the same few meals over and over again throughout a month without realizing it. Keeping my old meal plans for reference help me to mix up the meals I make so we’re not eating the same food many times throughout the month. It also helps me find good recipes I’ve made in the past when I can’t think of anything to put on my meal plan. I guess you could say it’s a bit like a part of my recipe bank (maybe one day I will combine it so I don’t have so many different papers). The final step in how to meal plan on a budget is this: If you failed during your meal planning, don’t give up. Go ahead and start over, or just keep on going. Move past that unplanned trip to the grocery store that costed way more than you expected and start meal planning again. This time around make sure you are dedicated to sticking to your meal plan – no skipping and no cheating. If you’re not sure whether or not meal planning is right for you, make yourself stick with meal planning for at least a month. This will give you enough time to see the difference in your grocery bill and it will give you enough time to get a hang of it. What’s holding you back from learning how to meal plan on a budget? If you want to save money and see results within the month, start meal planning right away. It’s incredible how much money you can save simply by making a plan.